Standard P.O.L. 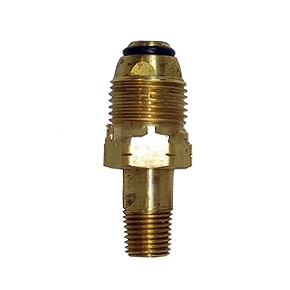 connector threads into most refillable propane/butane cylinders to connect to regulators, hoses and other fittings (POL = CGA 510; 0.855-14 NGO-LH; meaning Compressed Gas Association 510 standard, .885" diameter thread, 14 threads per inch, National Gas Outlet form, left hand thread). Soft Nose Design: Has O-ring to improve sealing and eliminate leaks. Straight through flow design - No excess flow safety device installed in this P.O.L. Not for use with gas grills and other low pressure devices without additional flow safety device. Hose connector end is 1/4" MPT (MALE RIGHT HAND PIPE THREAD) type.